This modern calligraphy script has been attentively written, with gentle curves to produce a font thats completely distinctive and original. It contains a full set of lower & uppercase letters, a large range of punctuation, numerals, and multilingual support. 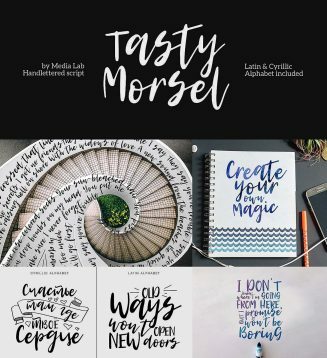 Perfect for adding a elegant and unique touch to your lettering projects and branding. File format: .ttf, .otf for Photoshop or other software. Tags: calligraphy script, cyrillic, cyrillic script, elegant font, multilingual.